Modern Primitive Tiki Mug/Mai Tai Bucket - Green Eyes BA806GR Free Shipping. 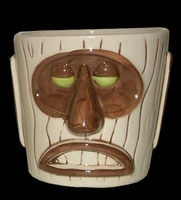 Modern Primitive Tiki Mug/Mai Tai Bucket - Green Eyes We bring you our newest design from our newest designer! From the world famous beautiful city of Paris France, Philippe Tilikete is our newest designer! We liked Philippe's simple and fresh approach to Tiki. Simple, clean lines yet with a primitive twist. With a slightly cantilevered top and done up in natural tones with a brown underglaze, brown eye orbits and green eyes, we hope you dig our newest addition to our line-up! Measures 3 1/2" in height and holds a very mai-tai suitable 11 oz.